Britain isn’t renowned as one of the world’s centres of gastronomy. London, though jam-packed with a tantalising range of restaurants for every palate, isn’t hailed as a foodie capital. So, joining the Eating London food tour I was keen to see how they could highlight the best of British food. Eating London’s sister company, Eating Italy, has been running tasty tours of Rome and the surrounding regions for over two years. But Italy isn’t lauded as Eataly for nothing – it’s one of the world’s favourite countries for food. London could be a long way off the mark, or perhaps it’s just undiscovered, I mused. Traditionally British food hasn’t been celebrated around the world. However, it has improved markedly in the past 15 years or so, partly fuelled by the nation’s passion for the creations of celebrity chefs. So I was intrigued by what Eating London could offer, and more so that the company had chosen to start its British offering with an East End Food Tour. 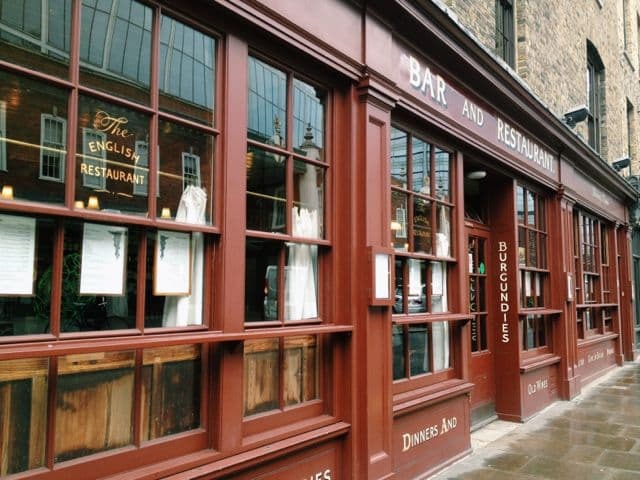 Who doesn’t want to visit a Londoner’s local pub? 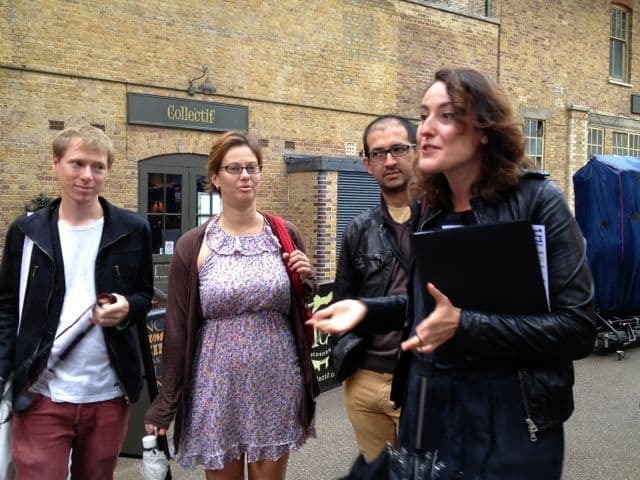 Guide Nicole Monaco led the tour, largely through the Spitalfields and Shoreditch areas. Though hailing from Australia, Nicole fell in love with the East End after relocating to London. So in many respects the tour is led by a local – someone passionate about the area who jives with its rhythm and can share personal recommendations. 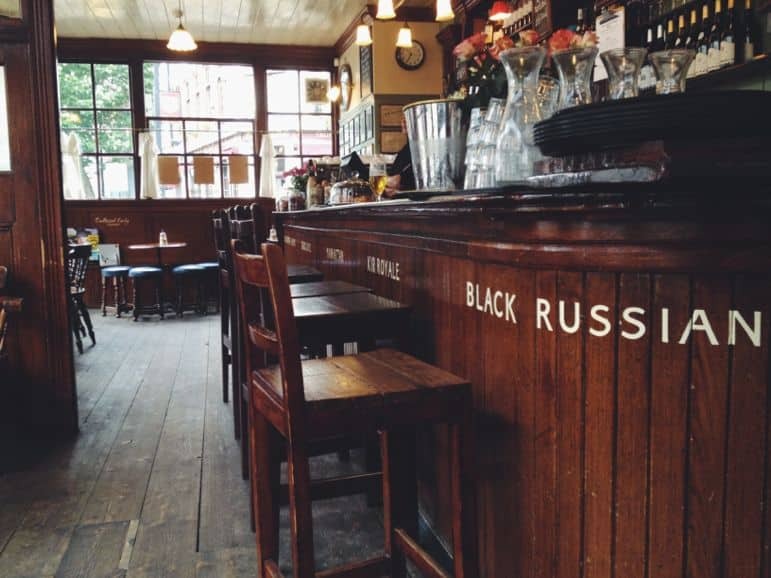 Who doesn’t want to visit a Londoner’s local pub for instance? 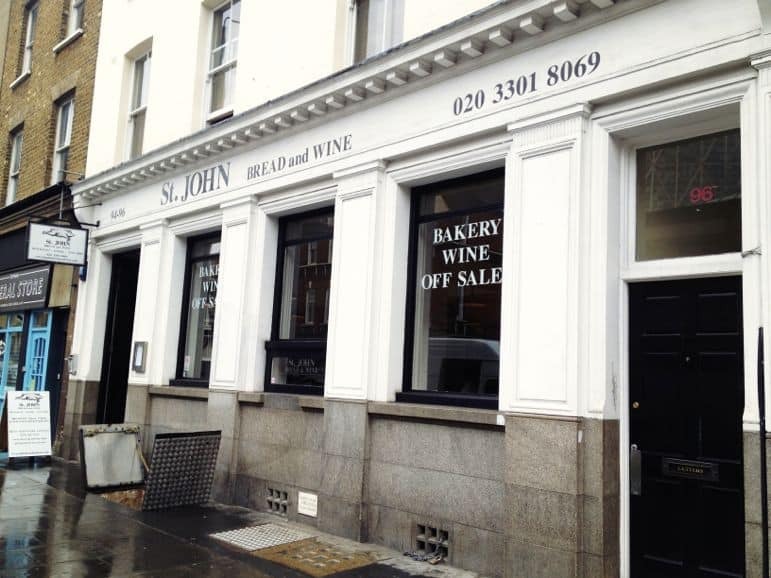 The tour started as every good morning should, with a bacon sandwich at St John Bread & Wine, in Commercial Street. 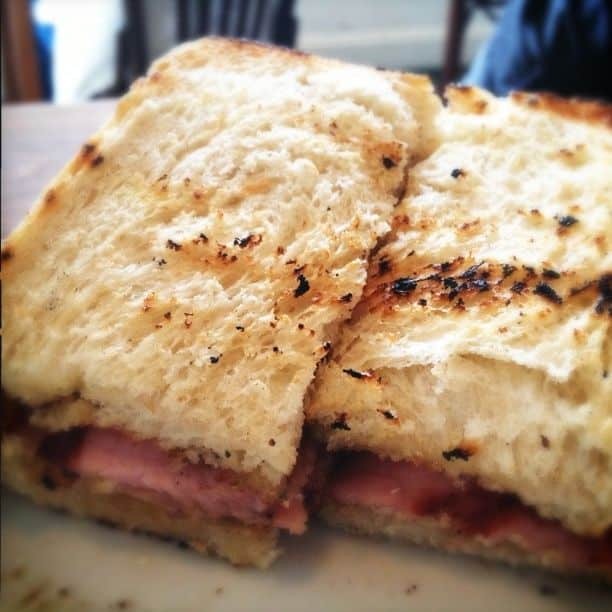 Bacon sandwiches are popular in Britain, but the St John one is special as its made with bacon cured on site, freshly made bread and their own secret recipe ketchup. 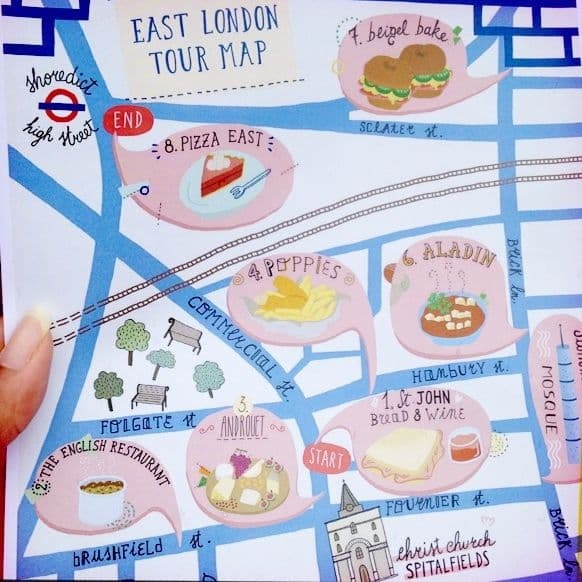 We moved on from St John with Nicole giving us a history of the area, this wasn’t just a food tour, but a historical journey through London’s East End via the food that has helped shaped its culture. We were soon back at Spitalfields Market – the meeting place for our tour – and Nicole explained how the trendy clothes traders there had replaced the fruit and vegetable traders and fishmongers of years past. Next the Eating London tour rounded upon The English Restaurant – one of the oldest in the area, it has been beautifully maintained, with old-fashioned wooden interiors. Here we sampled a very traditional British dish. 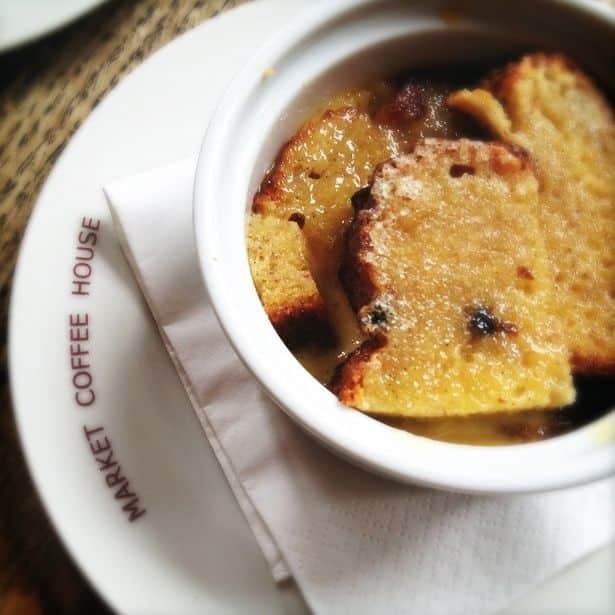 Bread and butter pudding was created as a way of using up stale bread, and the stodgy meal was hearty enough for local dockers and market traders. The English Restaurant serves a banana bread and butter pudding served with vanilla custard. Despite being conscious of the numerous stops to come on this food-filled tour, I couldn’t help but eat every last delicious spoonful. 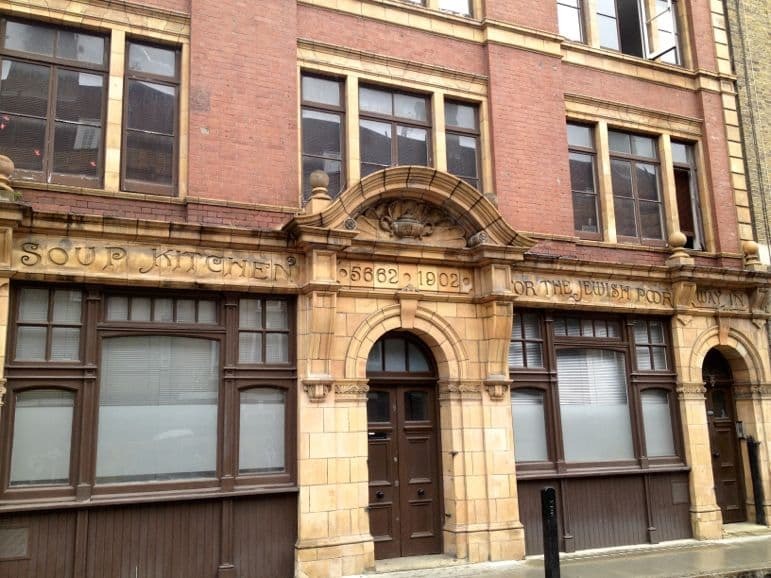 As we wandered the back streets of Spitalfields, Nicole explained how food had shaped the area. We passed soup kitchens set up by Jewish migrants to help the local poor. This area of inner city London had been so poor that the soup kitchen only closed in 1999. But London’s East End food history is also one of migration. 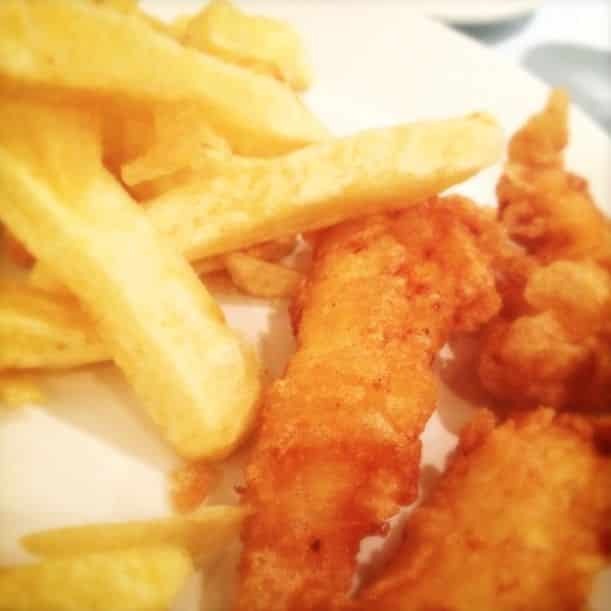 One of Britain’s most popular fast foods, fish and chips, is thought to have been imported by Portuguese Jewish migrants. Fish was widely available as fishing was an important trade in Victorian London, with cod coming into the city via the Thames Estuary. Meanwhile oysters and eels were found in great numbers in the river – hence another popular East End food jellied eels. As I’m not a fan of jellied fish, I was happy to see tasty cod on the menu at Poppies, our next stop. 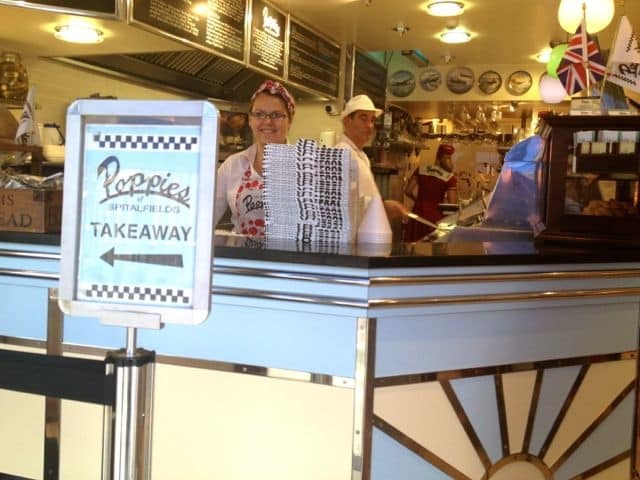 Fish and chips is by no means fine dining, but it is a popular British takeaway meal and one visitors often want to try. 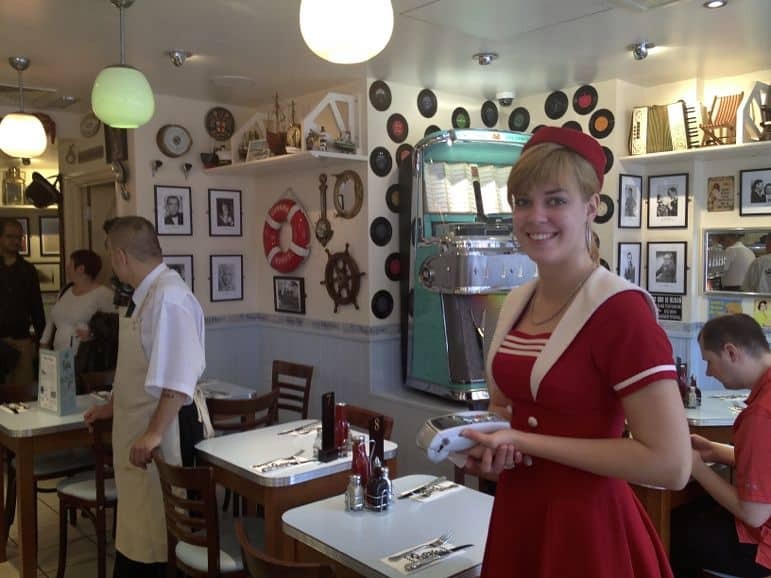 I loved Poppies’ interiors – 1950s style complete with a jukebox and staff dressed in naval outfits from the same period. Spitalfields is an area I know well. As a Londoner I grew up a few miles from there, worked my first job nearby and visited the market many times. But it’s been a long time since I visited and it’s changed a lot. Spitalfields’ redevelopment has added chic glass-fronted restaurants facing onto the market square, full of trendy clothes and organic products. Our next stop, Androuet first found fame with a stall in the market. The French cheese company has been wowing Londoners with its wide selection of British cheeses since it started trading. 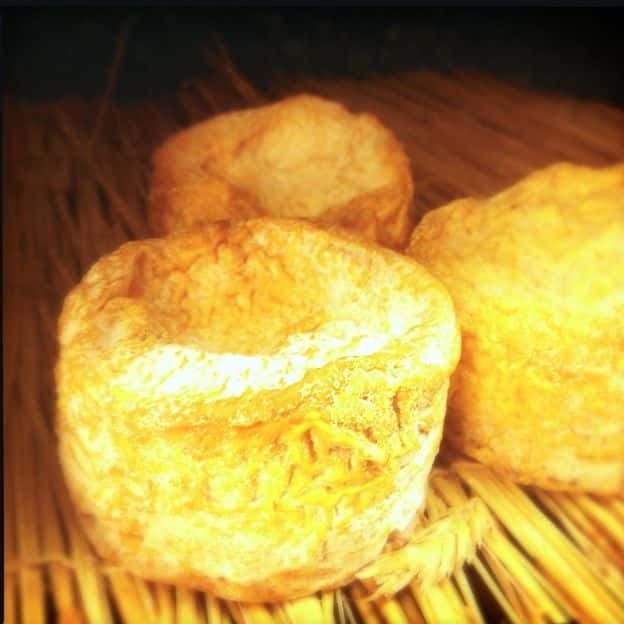 It now has a shop, in Spitalfields, where it also matures its own cheeses. Filling up on cheesy goodness, I was glad for the walk to our next Eating London stop, and that it was a drinking one. At the The Pride of Spitalfields pub we sampled Truman’s Ale and Orchard Cornish Cider. This was the least inspiring stop for me, but I’m British and have visited more than my fair share of pubs. Still I’d imagine international visitors would love this taste of British pub culture. Right round the corner we found ourselves on one of London’s most popular foodie streets. 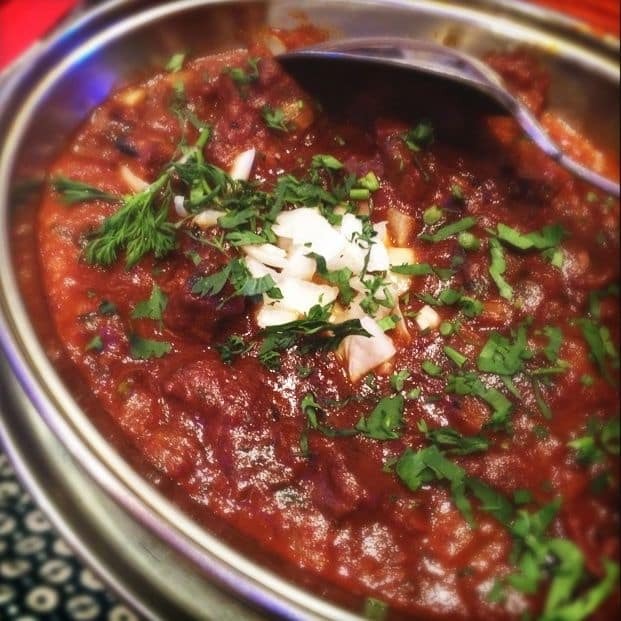 Brick Lane is London’s Indian cuisine centre. Today the area is largely inhabited by Bangladeshis, the latest in a long line of migrants, including the French, and Jews who moved in and out of the area. 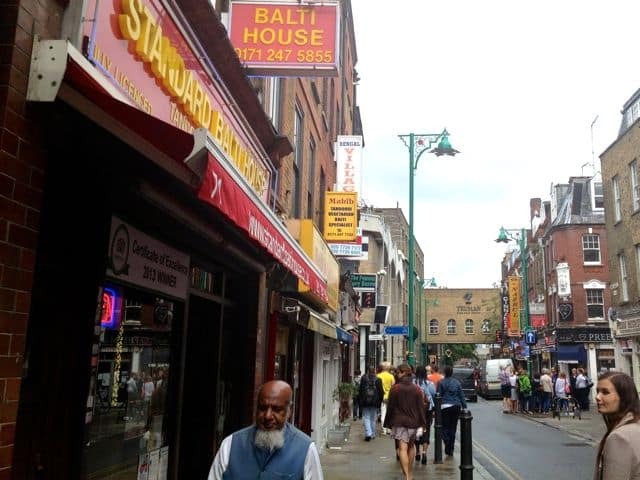 Aladin Restaurant is rated as one of the best in Brick Lane and had some seriously tasty curries. Oddly, curry is the British national dish – more curries are eaten in the country than anything else. The country also has numerous dishes that are distinctly British, bearing little resemblance to those cooked in Asia. But they’re delicious and I was particularly taken by Aladin’s sweet and sour lamb pathia. Moving on we wandered towards Shoreditch stopping at the popular Beigel Bake for a hot salt beef beigel. 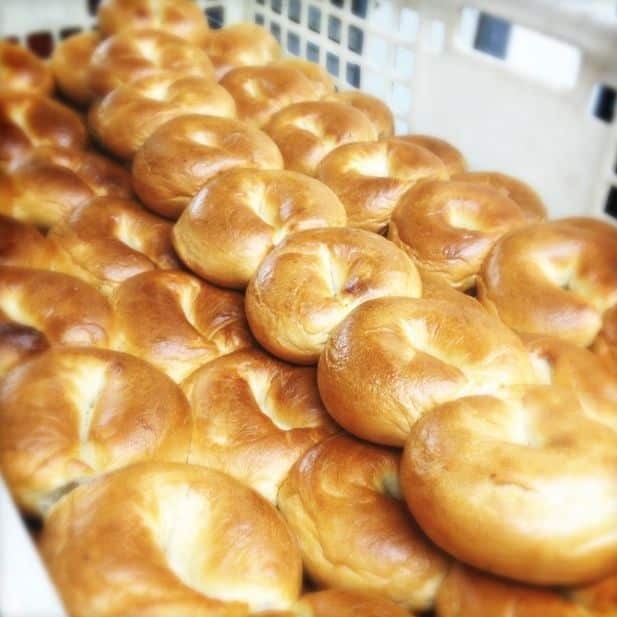 Open 24-hours-a-day, it’s particularly popular with London’s Jewish community. Finally we rounded off our Eating London tour with a stop at one of the area’s trendiest foodie-spots, Pizza East, part of the Soho House members’ club group. 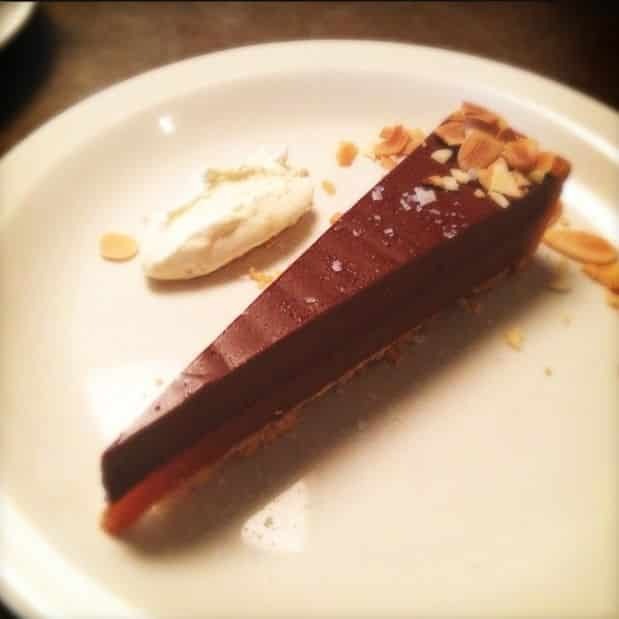 There we sampled a delectable salted caramel chocolate tart. London is currently gaga about salted caramel, and it this rounded off perfectly our exploration of the city’s food culture. As someone born and bred in London, I figured I knew the story of its people and its food pretty well. But the Eating London East End food tour taught me you never stop learning, nor seeing things with fresh eyes. I came away full on delicious foods and with a new perspective on London. The Eating London East End food tour runs six days a week and costs £59 per person (including all your food). Looking for other food and London travel inspiration? 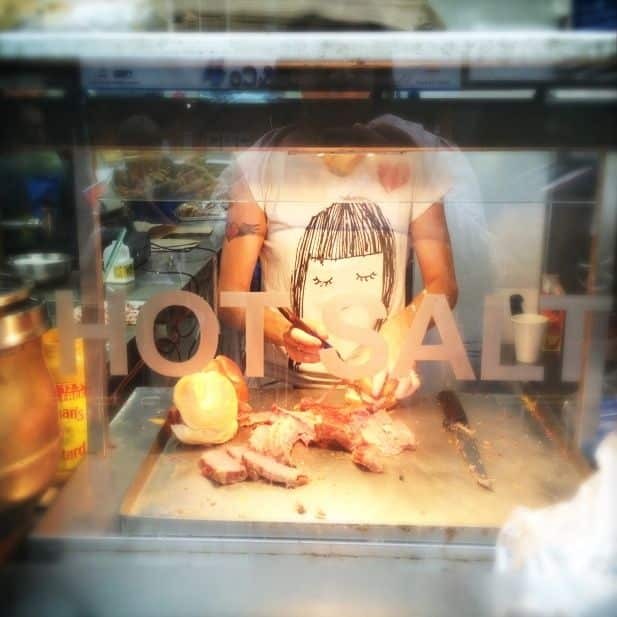 Check out their London Food Blog.